After the catastrophic events of September 11, 2001, founder Amy Mahoney befriended a FDNY rescue-and-recovery worker named Daniel who worked daily at Ground Zero. One night, Daniel confided in Amy all of the trauma he had endured through his rescue and recovery work. He spent hours divulging the horrific details, memories, experiences—even smells—he had witnessed at ground zero. Amy was the first and the only person with whom he shared these stories. After that night, Amy realized how traumatized Daniel was and made various attempts to reach out to him to offer her services for free. A few weeks after he had shared his stories with Amy, Daniel committed suicide. Looking back now it was clear that he was suffering from untreated post-traumatic stress. Daniel took his own life June 8, 2002. This personal experience, along with Amy’s father, who served as a Marine in Vietnam, motivated her to start researching effective treatment protocols for Combat Veterans and 9-11 First Responders who suffer from post traumatic stress. 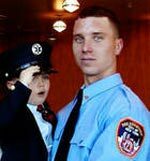 Peaceful Minds is dedicated to the memory of Daniel E. Stewart, FDNY #1399, to September 11th First Responders, and to all of Our Fallen who lost their lives for the War on Terror. 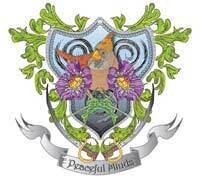 The three spirals represent the healer, the soldier and the healer and soldier coming together. The purple spiral represents the healer. The green spiral represents the soldier. The purple and green spiral represent the healer and soldier coming together to heal. Poppy flower represents our fallen soldiers.